From November 5th to 16th, we will be collecting spent household batteries from residents. Place your spent household batteries in a clear bag. Recycle your bag of batteries by putting this bag on top of your papers blue box. Put your AA, AAA, C, D, 9V, 96, and button cell batteries in a plastic, resealable bag. Ensure that 9V, 96, and button cell batteries are covered with masking tape on the exposed terminals (the top part with exposed metals). If you don’t have a resealable clear bag, stop by Quinte Waste Solutions at 270 West St. in Trenton get a free one while supplies last. Please place your bag of batteries on top of your papers blue box. Ensuring that the bags are placed in a clear resealable bag will allow the drivers to see what is in the bag. Batteries are harmful to the environment when they are thrown into the garbage. Batteries contain chemicals that can be harmful to wildlife when they leach into the environment. We send all the batteries collected from the curb to Raw Materials Company in Port Colborne Ontario. 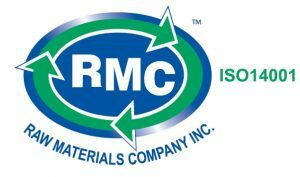 Click on the logo below to learn about how Raw Materials Company recycles your batteries.